Flea treatments are easy to find, but choosing the best flea shampoo could prove a difficult task. Luckily for you, we have examined and reviewed some of the items ourselves, and we came to the conclusion that the Pet Diesel Shampoo & Conditioner is the perfect solution because it’s an 2 in 1 wonder product, it relieves from itching, it provides proper moisturizing, and efficiently repels fleas. If the Pet Diesel Shampoo & Conditioner is not available for sale, choosing the Arava Flea & Tick Control is the best alternative in terms of price, list of active ingredients, and efficiency. Thanks to the balanced blend of lavender oil, your dogs and cats will get an instant calming effect while bathing and get rid of all of the nasty fleas. The coat will not only start to feel silky smooth, but the shampoo will also moisturize dry, itchy skin and hot spots to leave your pet clean and relieved. Some pets did not react well to this product, so make sure you pay attention to your furry pal’s behavior after using this treatment. If you are looking for an eco-friendly choice, this one uses only organic ingredients specifically designed to meet the needs of sensitive dog breeds. The mild combination of active ingredients and natural essential oils will eliminate fleas and leave the fur and skin refreshed and healthy. 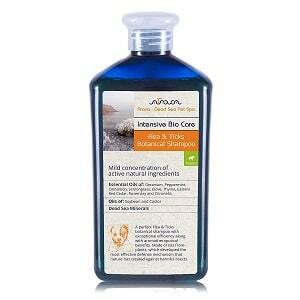 It does not contain harmful chemicals and the brand prides itself in using only 100% natural and safe ingredients. It is also specially formulated for use on puppies. 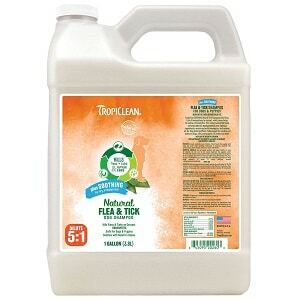 It appears that the formula will only get rid of fleas for up to two days. What’s more, fleas can build up a resistance to the treatment. Puppies have special needs and the Arava formula uses only natural ingredients that will eliminate fleas and get rid of infestations efficiently and quickly. The solid formula is perfect for deodorizing and soothing skin thanks to the antimicrobial blend of essential oils and diatomaceous earth. It is a non-toxic flea treatment that caters to pets that are prone to getting skin allergies and irritations. It is available in a multitude of scents. The solid shampoo has a bigger concentration of active ingredients, which might not go well with pets that have sensitive skin. The shampoo bar is the perfect choice for people that don’t like liquid shampoo formulas, and it does not utilize harmful ingredients, nor does it contain parabens. Most of the pet shampoos out there tend to solve the dirtiness problem but offer, in return, a dry scalp, and numerous other problems, including dandruff, irritation, and others. 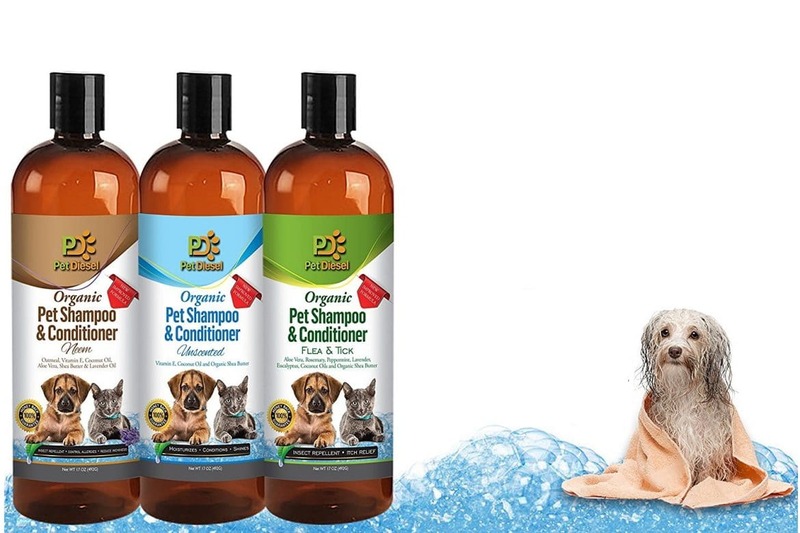 This shampoo and conditioner is different as it provides a balanced hydration, soothes and comforts your dog’s scalp, skin, and fur, while also providing maximum protection against fleas and ticks. The best part is that it is 100% organic, so your dog will only benefit from the miraculous effects of natural essential oils, such as eucalyptus, aloe vera, rosemary, peppermint, and lavender, as well as organic shea butter. The results are extraordinary – your dog’s skin will look smooth, silky, and shiny, while the skin will be relieved from dandruff and dryness, as well as fully protected against ticks and fleas. The eco-friendly products of this company are specifically designed to meet the needs of pretentious and sensitive dog breeds while providing only organic ingredients that are good for the environment and the health of your pawed friend. This amazing dog shampoo provides a mild combination of natural essential oils and active ingredients to soothe, calm, and hydrate the skin and soften the fur of your dog. Amongst the essential oils you will find in this shampoo. one can recall peppermint, clove, thyme, rosemary, citronella, and others. The soybean and castor oils, alongside a selection of Dead Sea minerals will provide full protection for your dog’s coat and skin. This botanical shampoo is the perfect flea and tick repellent as it not only scares off pests but will also prevent the emergence of new larvae. 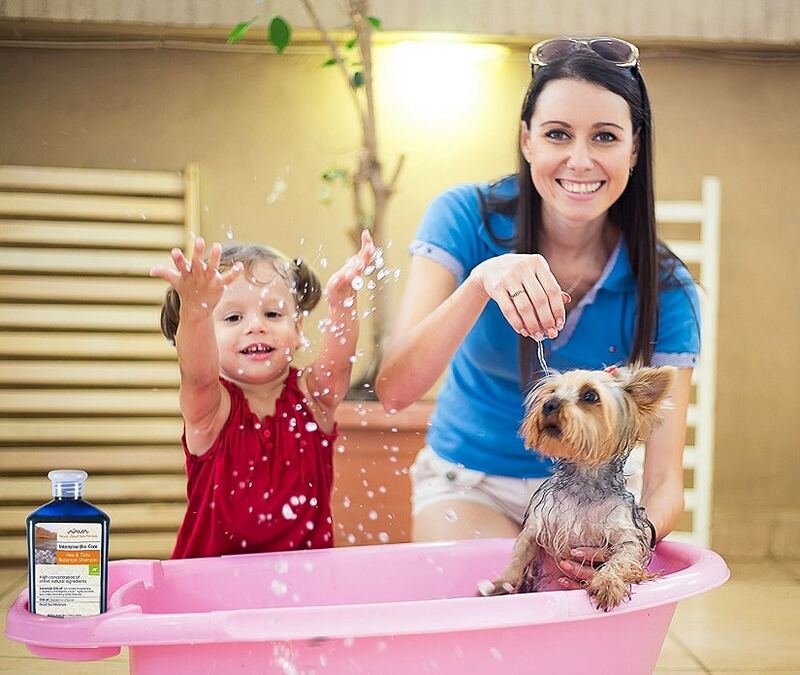 Enriched with aromatherapeutic benefits, this shampoo will easily become your pooch’s favorite whenever bathing. Most of the customers who have purchased this shampoo were more than pleased by its delicate, yet lovely scent, as well as by its repelling effects. In addition, for every Arava product you purchase, the company will make a direct donation to an animal rights organization. 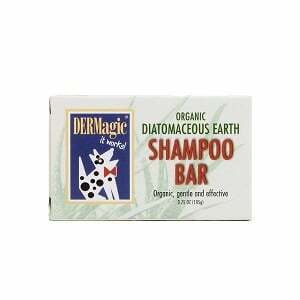 For those of you who prefer bars instead of liquid shampoo formulas, this DERMagic shampoo for dogs represents one of the best options. It is made with 100% natural ingredients, so it is non-harmful, doesn’t contain parabens, and won’t cause irritation or further skin and fur problems to your dog. Handmade in the United States, this shampoo bar contains a unique blend of essential oils and diatomaceous earth for an improved, non-toxic flea treatment. The shampoo bar comes in various flavors to choose from, from regular chamomile, peppermint, and rosemary lavender, to the ones for your dog’s specific needs such as skin rescue or DE flea. This flea bar commits to killing fleas while providing an antimicrobial, therapeutic, and calming effect on dogs with dry or oily skin. It is free from toxins, chemicals, preservatives, and sulfites, so you can rest assured your dog won’t risk allergies or irritations. If you buy 10 shampoo bars of any kind, the company will plant a tree on your behalf! The natural formula provided by this pet shampoo is safe to use for routine baths on both dogs and cats, regardless of their size or breed. Pups and kittens can benefit from a full bath treatment with these shampoos too, as long as they are over 12 weeks old. This nice-smelling shampoo will help kill ticks and fleas while preventing others from reappearing in your pawed friend’s fur coat. The cocoa extract will help soothe and calm the skin to prevent and treat irritations, as well as other scalp problems such as dandruff or dehydration. The unique blend of ingredients counts for essential oils, lemongrass, and sesame oil, for long-lasting results. Thus, your dog’s skin will be fully protected against ticks, mosquitoes, and fleas, while smelling great and remaining clean for a long time. Keep in mind that this shampoo kills fleas on contact and that it contains xanthan gum, which may be an allergenic compound. This efficient, all-natural formula kills all fleas, ticks, eggs, and larvae on contact, leaving a healthy-glowing skin for your dog or pup. It doesn’t contain pyrethrin or permethrin, the usual chemical compounds found in most flea repellent medicines, so it is safe to use. The shampoo offers a natural alternative to chemicals and medicines while maintaining the same level of efficiency. This shampoo is also suitable for dogs with dry and irritated skin, thanks to its soothing effects, it will nourish the dog’s derma and help prevent further scalp and skin irritations. Combined with the calming and natural repellent effects of lemongrass, cocoa, and sesame oil, the product will definitely become one of your dog’s regulars and favorites. 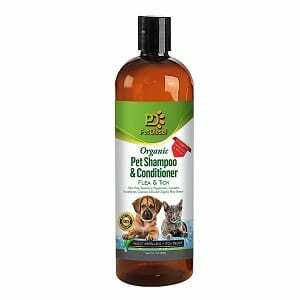 Thanks to its selection of natural and active ingredients, the shampoo is suitable for dogs, cats, puppies, and kittens, regardless of their breed or weight. The only condition is for pups and kittens to be at least 12 weeks old when being bathed with the shampoo. We live in an era where organic and natural cosmetic products become more and more popular while providing all the necessary nutrients for our skins. We cannot help but be pleased that we encounter the same tendency in animal products, showing that we have the same respect for our pets’ health as we have for ours. 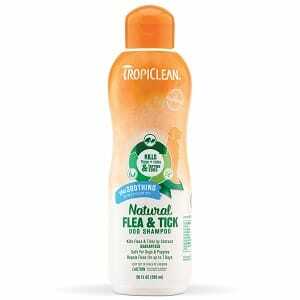 However, since there are so many good hygiene products available for sale, choosing the best natural flea shampoo for dogs could prove quite the challenge. In order to make sure you bought the perfect item, we enlisted a series of tips & tricks that will hopefully help you decide easier. Although we mainly talk about natural and organic shampoos from the start, it is important to state that some products may be more “natural” than others, depending on their share of active ingredients. Some products are only partially natural, meaning they still contain traits of chemicals, preservatives, or medicinal ingredients that could cause allergies to your dogs. So, we suggest opting for those with the best dogs’ natural flea shampoo ingredients, such as lemongrass, essential oils, rosemary oil, and others. Just like all other shampoos for people, dog shampoos also come in a liquid and solid form, depending on your preferences. Solid shampoos are easier to be kept and it is considered that they have a bigger concentration of active ingredients, whereas those ingredients are diluted with water when it comes to liquid shampoos. No matter what you choose, the right flea shampoo for dogs should be one that is mild with your dog’s skin and coat, and creates a natural barrier against pests, dirt, and dust. Most of the regular shampoos for dogs only cover the bad smells of your pooch and not really fight against them. Thus, we consider it is highly important to find a shampoo that deals with these smells once and for all. Again, you should look for those containing active natural ingredients which are known to remove bad smells, such as lemongrass or lavender. If you’re not really sure what to look for, reading some dog flea shampoo reviews could prove enlightening. We suggest going to specialized online forums or asking other pet owners for their own tips and tricks regarding the best cleaning products on the market. Although we are talking about pet shampoos, we must not forget about the number one characteristic that determined us to choose this type of products in the first place – their capacity to kill and keep away fleas and ticks. We believe that shampoos are the best types of dog flea treatments because they are easy to use and will provide a repellent formula that can last for around one month, depending on the internal composition. Moreover, most shampoos do not require to use them more than once a week so that they won’t finish too soon. In addition, most of these flea treatment shampoos help to fight another series of dog problems, including dandruff, oily skin, or excessive dryness of the scalp. In other words, not only your dog’s fur will be flea-less, but will also shine.